The One Pet-Sitter Secret Every Pet Owner Should Know! Home / Blog / The One Pet-Sitter Secret Every Pet Owner Should Know! It’s not easy being the parent of an adorable pup. The only thing worse is having to leave them with someone else. Let’s face it, you worry – are they getting the right food, being walked at the right time, getting along at the park. Well, we’ve found a great way to make sure you pup is in great hands while you’re away. The trickiest thing about leaving your pup with the pet sitter is all the instructions. 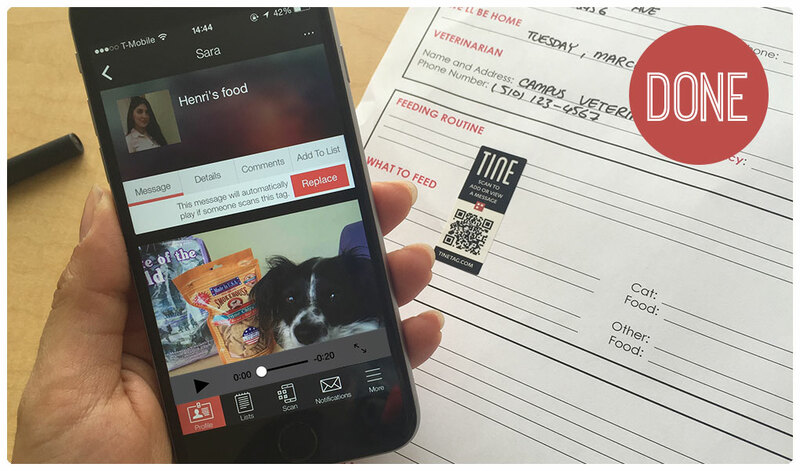 With the help of TINE Tag, you can attach video instructions to your pups stuff for your pet sitter, and the best part is you get notified when they watch your quick videos. No more wondering if they are doing it right, or if they are doing it at all. 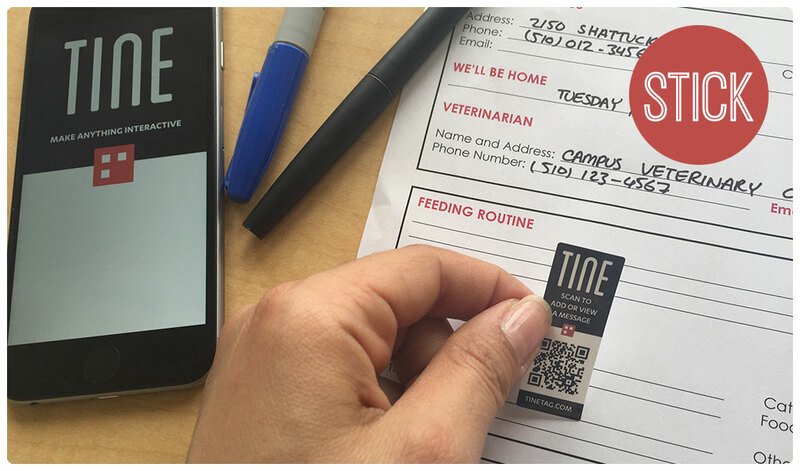 Step 1: Order your free TINE tags from within the app. Click on the More tab on the bottom right of the screen and select Request TINE Tags to enter your mailing address. They should arrive within 2-5 business days. Step 2: Stick a TINE tag on the corner of the paper, label it with the name of your pet, and a specific need like “Food.” You can do this for other needs like bath and litter box. If you’re using a template, stick the tags under the corresponding part. 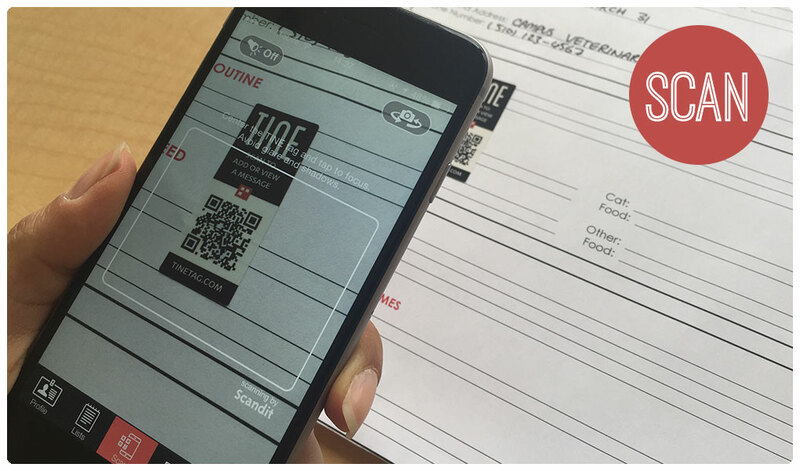 Step 3: Open the TINE app on your phone, and tap Scan. Align the sticker within the white borders and wait for confirmation that the tag has been scanned. Step 4: Now that you’re on the Quick Setup page, tap Add Video Message. Step 5: Tap the red button at the bottom of the screen and start recording the instructions. Let your pet sitter know where to find your pet’s food in the kitchen or special instructions on emptying the litter box. Tap the red button again to stop recording. Step 6: Record all the other instructions on separate tags, making sure not to miss anything important. And you’re done! All your pet sitter has to do is scan the tags with her phone and she’ll hear your instructions. Now, your pet will never miss feeding time even when you’re not home! You can download the app for iPhone and Android. 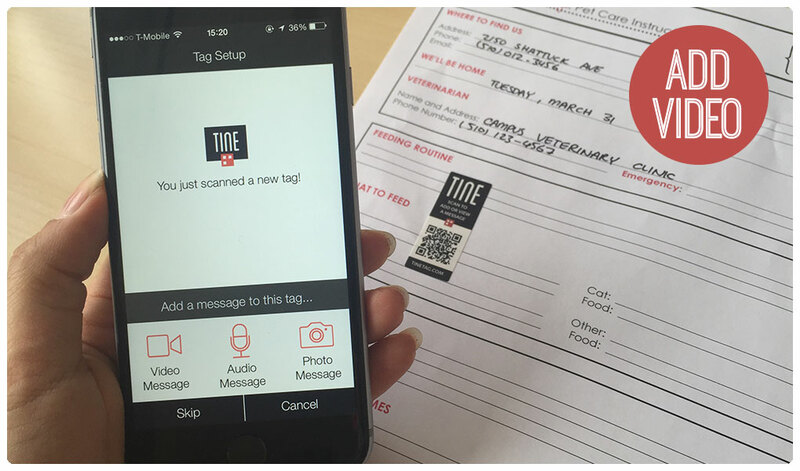 Don’t forget to order your free TINE tags from inside the app. You should receive them in the mail within 2-5 business days.